Last year someone told me that Memorial Day no longer means as much because we have so many intermixed cultures in the U.S. now. I beg to differ. While it has become a 3 day weekend to most, it is NOT just about picnics, BBQ's and swimming. Remember that without those brave men and women who died and are honored on Memorial Day, you may not have the rights that you do have. All of our freedoms came with a price for some and an observance for all. Memorial Day is about honoring the countless individual acts of bravery and sacrifice. This holiday is also about honoring the brave men and women who make it home. That means keeping our promises to America's veterans. This Memorial Day, we remember all the Americans who gave their lives in defense of America. They died so that we may be free - and we are forever in their debt. Too many people have lost sight of the meaning of this holiday. If you visit How to Observe Memorial Day you can read the whole article, but here is an excerpt that lists the highlights. 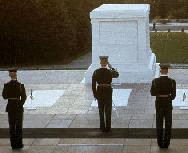 "...gather around their sacred remains and garland the passionless mounds above them with choicest flowers of springtime....let us in this solemn presence renew our pledges to aid and assist those whom they have left among us as sacred charges upon the Nation's gratitude,--the soldier's and sailor's widow and orphan." by renewing a pledge to aid the widows, widowers, and orphans of our fallen dead, and to aid the disabled veterans." "The National Moment of Remembrance, established by Congress, asks Americans wherever they are at 3 p.m., local time, on Memorial Day to pause in an act of national unity (duration: one minute).The time 3 p.m. was chosen because it is the time when most Americans are enjoying their freedoms on the national holiday. The Moment does not replace traditional Memorial Day events; rather it is an act of national unity in which all Americans, alone or with family and friends, honor those who died for our freedom. 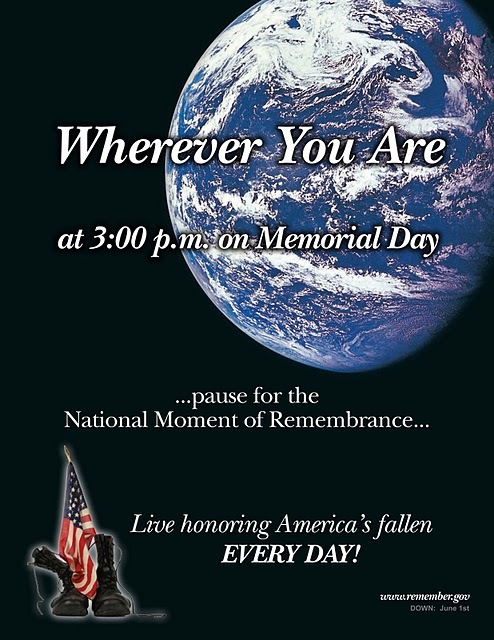 It will help to reclaim Memorial Day as the sacred and noble holiday it was meant to be. In this shared remembrance, we connect as Americans."